An earnings beat and a new contract helped Ambarella stock regain some ground last month. Shares of Ambarella (NASDAQ:AMBA) gained 15% in November, according to data provided by S&P Global Market Intelligence. The semiconductor company's stock saw positive movement at the end of the month following the company's third-quarter earnings release. 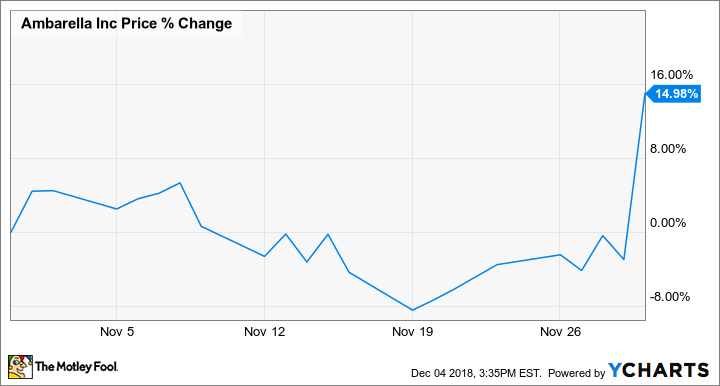 Ambarella reported third-quarter earnings after market close on Nov. 29, pairing results that came in ahead of the market's expectations with news that one of its chips had been selected for use in a machine-vision system. Despite positive share price momentum following the earnings beat, the company's stock has lost roughly a third of its value year to date. Ambarella's sales for the September quarter fell 35.7% year over year to land at $57.3 million, but that performance still came in slightly above the average analyst estimate's call for sales of $57.1 million. 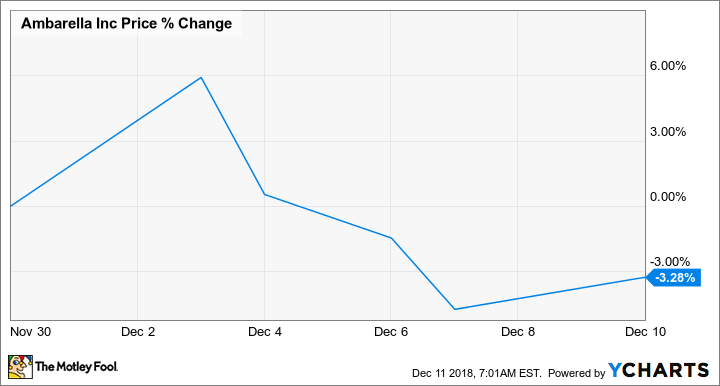 Adjusted per-share earnings of $0.21 were down roughly 75% from the prior-year period but also came in well ahead of the average analyst estimate's call for adjusted earnings of $0.09 per share. Expectations were low for Ambarella, and while its business still recorded steep declines, the significant earnings beat helped send shares higher last month. News that the company had secured a contract with an unnamed manufacturer for its CV22 image-processing chips to be used in an advanced driver-assisted system likely also played a role in the stock's gains. The company's business has been negatively impacted by GoPro (formerly the semiconductor company's biggest customer) opting to use a competitor's video-processing chips for its devices as well as overall slowdown for consumer video cameras. Looking ahead, Ambarella is hoping it can secure additional design wins in the security camera and automotive machine vision spaces in order to reenergize the business. Ambarella stock has slipped in December amid sell-offs for the tech sector. Shares trade down roughly 3.3% in the month so far. For the fourth quarter, Ambarella is guiding for sales of roughly $51 million, a non-GAAP gross margin between 59% and 60.5%, and non-GAAP operating expenses between $29 million and $31 million. That guidance still suggests a significant performance decline from the fourth quarter in 2017, which recorded sales of $87.5 million and a non-GAAP gross margin of 67.2%, and it's unclear if the company will be able to secure the design wins in the automotive space needed to return its business to consistent growth. Ambarella stock trades at roughly 61 times this year's expected earnings and 5.4 times expected sales.